Last Friday, I gave the first keynote at GUADEC 2016. I was delighted for the invitation from the GNOME Foundation to deliver this talk, which I entitled Confessions of a command line geek: why I don’t use GNOME but everyone else should . The Chaos Computer Club assisted the GUADEC organizers in recording the talks, so you can see here a great recording of my talk here (and also, the slides). Whether the talk itself is great — that's for you to watch and judge, of course. Your browser does not support the video element. Perhaps you can view the video on Youtube or download it directly. The focus of this talk is why the GNOME desktop is such a central component for the future of software freedom. Too often, we assume that the advent of tablets and other mobile computing platforms means the laptop and desktop will disappear. And, maybe the desktop will disappear, but the laptop is going nowhere. And we need a good interface that gives software freedom to the people who use those laptops. GNOME is undoubtedly the best system we have for that task. There is competition. The competition is now, undeniably, Apple. Unlike Microsoft, who hitherto dominated desktops, Apple truly wants to make beautifully designed, and carefully crafted products that people will not just live with, but actually love. It's certainly possible to love something that harms you, and Apple is so carefully adept creating products that not only refuse to give you software freedom, but Apple goes a step further to regularly invent new ways to gain lock-down control and thwarting modification by their customers. We have a great challenge before us, and my goal in the keynote was to express that the GNOME developers are best poised to fight that battle and that they should continue in earnest in their efforts, and to offer my help — in whatever way they need it — to make it happen. And, I offer this help even though I readily admit that I don't need GNOME for myself, but we as a community need it to advance software freedom. I hope you all enjoy the talk, and also check out Werner Koch's keynote, We want more centralization, do we? , which was also about a very important issue. And, finally, I thank the GNOME Foundation for covering my travel expenses for this trip. I crossed the Pacific ocean, the international dateline, left a day on deposit to pickup on the way back, and after 24 hours of almost literally chasing the sun, I arrived in Melbourne on the morning of Wednesday 3 February, road a shuttle bus, dumped my bags at my room, and arrived just in time for the Wednesday afternoon tea break at LinuxConf Australia 2016 in Geelong. Nearly everyone who heard this story — or saw me while it was happening — asked me the same question: Why are you doing this? . The five to six people packed in with me in my coach section on the LAX→SYD leg are probably still asking this, because I had an allergic attack of some sort most of the flight and couldn't stop coughing, even with two full bags of Fisherman's Friends over those 15 hours. But, nevertheless, I gave a simple answer to everyone who questioned my crazy BRU→AMS→PDX→LAX→SYD→MEL itinerary: FOSDEM and LinuxConf AU are two of the most important events on the Free Software annual calendar. There's just no question. I'll write more about FOSDEM sometime soon, but the rest of this post, I'll dedicate to LinuxConf Australia (LCA). LCA is community organized and operated. Groups of volunteers each year plan the event. In the tradition of science fiction conventions and other hobbyist activities, groups bid for the conference and offer their time and effort to make the conference a success. They have an annual hand-off meeting to be sure the organization lessons are passed from one committee to the next, and some volunteers even repeat their involvement year after year. For organizational structure, they rely on a non-profit organization, Linux Australia, to assist with handling the funds and providing infrastructure (just like Conservancy does for our member projects and their conferences!). 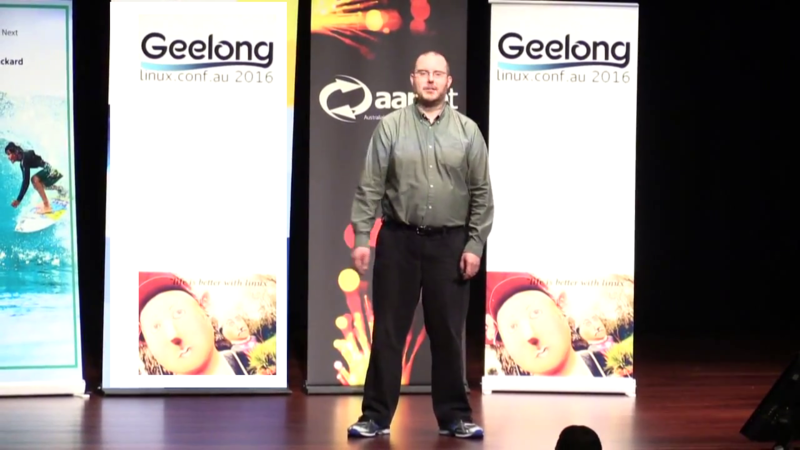 Speaking particularly of earlier this year, LCA 2016 in Geelong, Australia was a particular profound event for me. LCA is one of the few events that accepts my rather political talks about what's happening in Open Source and Free Software, so I gave a talk on Friday 5 February 2016 entitled Copyleft For the Next Decade: A Comprehensive Plan , which was recorded, so you can watch it, or read the LWN article about it. I do warn everyone that the jokes did not go over well (mine never do), so after I finished, I was feeling a bit down that I hadn't made the talk entertaining enough. But then, something amazing happened: people started walking up to me and telling me how important my message was. One individual even came up and told me that he was excited enough that he'd like to match any donation that Software Freedom Conservancy received during LCA 2016. Since it was the last day of the event, I quickly went to one of the organizers, Kathy Reid, and asked if they would announce this match during the closing ceremonies; she agreed. In a matter of just an hour or two, I'd gone from believing my talk had fallen flat to realizing that — regardless of whether I'd presented well — the concepts I discussed had connected with people. ContractPatch, step 1: Everything Is Negotiable. About a year ago, I got talking with some friends in the tech industry about contracts. And it began to sound like something was very, very wrong. And almost all of the contracts were bad. Not badly written, though some were. Not legally unenforceable, though some were. They were bad for the people who signed them. They waived important legal rights, gave the employer ownership of ideas and projects it had no reason to take, or imposed serious limits on future work. And people often didn’t realize how bad these were, the risks they’d agreed to, or what rights they’d given up. Among the few who did, most didn’t realize they could negotiate these terms. Others did, but weren’t sure how to start. Several assumed their employer wouldn’t enforce the more onerous terms. Nobody should bet their future on that assumption. Doing so is to build one’s career on a house of cards. But that won’t change until enough people speak up and push back, and have the tools to do so. That’s where this project began for me. About a month ago, I sat down over lunch with friends from Software Freedom Conservancy, and learned they’d embarked on a similar project at around the same time. In fact, Karen Sandler recently spoke on the subject as OSCON 2016. We’re calling it ContractPatch. The idea is to provide strategy and legal knowledge to workers, along with some sample language for better contract terms. Everything is negotiable. Keep repeating that until it sticks. Merely knowing that is an edge. Companies know it, but often don’t want their employees or potential hires to realize it. Some employers even structure their hiring, renewal, and termination processes to discourage negotiation. This can halt inexperienced negotiators, especially those from historically underrepresented groups who face widespread employer prejudice that can undermine their perceived ability to negotiate. Everyone will enter a negotiation with different leverage, different goals, and unique needs and strengths. There are no magic words, but anyone can learn the techniques and strategies to approach contract negotiations. Like any other skill, it may not be easy at first. Also like any other skill, it can be broken down into steps, practiced, and will become easier over time. And we’re here to teach. In the coming months, we’ll write about legal and strategic points in contract negotiation strategies, pre-negotiation prep and practice, methods for negotiating, and we’ll provide information on your legal rights around contracts. Down the road, we’ll look at specific contract provisions — especially those that impact tech workers the most, such as non-compete agreements and intellectual property assignment clauses. This will go hand-in-hand with a Github repository with forkable sample language for key contract provisions, such as payment terms, benefits, non-competition and non-solicitation agreements, and intellectual property assignment clauses. But let’s walk before we run. The first step is knowing you can negotiate. Next, we’ll discuss the balance of power in hiring agreement negotiations, and how to self-evaluate your position before a negotiation begins. After that, we’ll cover timing and strategies around contract renewals, raises, and other opportune moments to renegotiate. Whether it’s an employment offer, a mid-project contract renewal, or a termination agreement, its terms can be pushed on. Often, they can be changed. And getting there gracefully is an art, more dance than declaration. And we want you to know as much as you can before your next dance starts. The GNU General Public License (GPL) was designed to grant clear permissions for sharing software and to defend that freedom for users. GPL'd code now appears in so many devices that it is fundamental to modern technology. While we believe that following the GPL's requirements is neither burdensome nor unreasonable, many fail to do so. GPL enforcement — the process to encourage those who fail to correct problems and join our open software development community — is difficult diplomacy. Our community learned together over the last 20 years how to do this work well. Last year, Conservancy and the FSF published the concise but comprehensive Principles of Communited-Oriented GPL Enforcement. The Principles are endorsed by Conservancy, FSF and gpl-violations.org — the three historic community-oriented GPL enforcement organizations, as well as other non-enforcing organizations such as OSI. Recently, these principles were also endorsed by the Netfilter team, a core and essential group of Linux developers. However, despite our best efforts, we have been unable to convince all enforcers to endorse these Principles. Here, we express our concern and desire to ameliorate that situation as best we can. Furthermore, we also bring some transparency and context where enforcers seem unlikely to ever endorse the Principles. One impetus in drafting the Principles was our discovery of ongoing enforcement efforts that did not fit with the GPL enforcement community traditions and norms established for the last two decades. Publishing the previously unwritten guidelines has quickly separated the wheat from the chaff. Specifically, we remain aware of multiple non-community-oriented GPL enforcement efforts, where none of those engaged in these efforts have endorsed our principles nor pledged to abide by them. These “GPL monetizers”, who trace their roots to nefarious business models that seek to catch users in minor violations in order to sell an alternative proprietary license, stand in stark contrast to the work that Conservancy, FSF and gpl-violations.org have done for years. Most notably, a Linux developer named Patrick McHardy continues ongoing GPL enforcement actions but has not endorsed the community Principles. When Patrick began his efforts, Conservancy immediately reached out to him. After a promising initial discussion (even contemplating partnership and Patrick joining our coalition) in mid-2014, Patrick ceased answering our emails and text messages, and never cooperated with us. Conservancy has had no contact with Patrick nor his attorney since, other than a somewhat cryptic and off-topic response we received over a year ago. In the last two years, we've heard repeated rumors about Patrick's enforcement activity, as well as some reliable claims by GPL violators that Patrick failed to follow the Principles. In one of the many attempts we made to contact Patrick, we urged him to join us in co-drafting the Principles, and then invited him to endorse them after their publication. Neither communication received a response. We informed him that we felt the need to make this public statement, and gave him almost three months to respond. He still has not responded. Patrick's enforcement occurs primarily in Germany. We know well the difficulties of working transparently in that particular legal system, but both gpl-violations.org and Conservancy have done transparent enforcement in that jurisdiction and others. Yet, Patrick's actions are not transparent. In private and semi-private communications, many have criticized Patrick for his enforcement actions. Patrick McHardy has also been suspended from work on the Netfilter core team. While the Netfilter team itself publicly endorsed these Principles of enforcement, Patrick has not. Conservancy agrees that Patrick's apparent refusal to endorse the Principles leaves suspicion and concern, since the Principles have been endorsed by so many other Linux copyright holders, including Conservancy. Nevertheless, Conservancy does not object to individual copyright holders who wish to enforce alone; this is their legal prerogative, and with such limited resources for (and political opposition against) GPL enforcement on Linux, everyone who wants to help is welcome. However, Conservancy must denounce anyone who refuses to either endorse the Principles, or (at least) publicly explain why the Principles are not consistent with their efforts to advance software freedom. There are few public facts on Patrick's enforcement actions, though there are many rumors. That his enforcement work exists is indisputable, but its true nature, intent, and practice remains somewhat veiled. The most common criticism that we hear from those who have been approached by Patrick is an accusation that he violates one specific Principle: prioritizing financial gain over compliance. Meanwhile, some who criticize Conservancy's enforcement efforts ironically believe we are “too nice” — because we don't seek to maximize financial gain, and therefore we ultimately fund some license compliance work with donations from the general public. Despite that criticism, and the simple fact that Conservancy's settlement funds from GPL enforcement usually fail to cover even the staffing costs associated with our enforcement efforts, we continue to abide by the Principle that compliance is paramount over monetary damages. While we sympathize with those who wish GPL enforcement would fund itself, we also see clear problems if an enforcer prioritizes financial gain over compliance — even if the overarching goal is more comprehensive enforcement in other areas. Conservancy does all our enforcement specifically through a USA 501(c)(3) charity, precisely because that makes us transparently financially accountable. The IRS requires that our work benefit the general public and never bestow private inurement to anyone. Success in enforcement should never personally benefit one individual financially, and a charity structure for GPL enforcement ensures that never happens. Furthermore, the annual Form 990 filings of charities allows for public scrutiny of both enforcement revenue and expenditure1. Conservancy, as a charity in the center of GPL enforcement, seeks to make enforcement transparent. We devised the Principles in part to clarify long-standing, community-accepted enforcement procedures in a formalized way, so that violators and GPL-compliant adopters alike can discern whether enforcement behavior is acceptable under community norms. We welcome public debate about any enforcement action's compliance with the Principles (i.e., its meta-compliance with the Principles). We encourage all those who enforce GPL to come forward to either endorse the Principles, or publicly propose updates or modifications to the Principles. (We've created the mailing list, principles-discuss, as a public place for that discussion.) We urge developers to state that they support enforcement undertaken in a principled manner, including litigating only as a necessary last resort and to never prioritize financial gain. We chose the phrase “meta-compliance with the Principles” carefully. Applying the Principles themselves to compliance with those Principles seems apt to us. For example, we publicized the concerns about Patrick's enforcement only after two years of good-faith attempts to discuss the problems with him, and we waited for more than a year before publicizing the problem, and only after both ample warning to Patrick, and discussion and coordination with the Netfilter team. Just as we would with a GPL violator, we exhausted every path we could find before making this statement publicly. Thus, we now call on Patrick to endorse the Principles or publicly engage in good faith with the community to discuss proper methods of enforcement. We further welcome anyone who does not currently abide by these Principles to join us anew in our coordinated community-oriented GPL enforcement work. In conclusion, to contrast GPL enforcement with the much more common proprietary software litigation, violators should always have a simple and solid method to quickly resolve the rare legal action around the GPL: compliance. GPL enforcers should always seek compliance as the primary and paramount resolution to any enforcement matter. In this manner, where community-oriented enforcement exists and thrives, the risk for danger from lawsuits diminishes. Today's violators can then become tomorrow's contributors. Finally, if you are in a situation where you are unsure what your obligations are under GPL, we urge you to read and study the Copyleft Guide to learn more about how to properly comply with GPL and other copyleft licenses. 1 Looking at Conservancy's Form 990s, you can see by examining Page 2 (Part III) (in FY 2011, see Page 25, Schedule O, for continuation) each year how much revenue Conservancy received from enforcement settlements, and how much Conservancy spends on license compliance activity. Most notably, Conservancy has not received a single dollar in GPL enforcement revenue since FY 2012.